Whether you're straightening, curling or creating Hollywood waves, the ghd original IV styler can help you achieve a professional finish no matter what your choice of hairstyle is. This styler makes styling your hair simple whatever your hair type, and delivers a sleek and smooth finish with minimum fuss. The award-winning ghd original styler has a rounded barrel so you can create an effortless finish in no time. Heating up to 185°C, you’ll be able to create your look at the optimum styling temperature and achieve flawless style without the hassle. Perfect for everyday use, the ghd original IV styler is an essential for keeping your hair looking fabulous all day long. 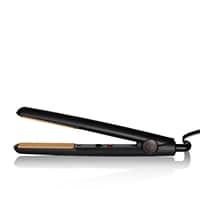 These straighteners are great for short or long hair, I’ve had both so I have used them to straighten, to flick, to curl etc etc...I have used over at least 30 different tongs and straighteners over the years and find these do not wreck my hair, in fact this is why I tried them in the first place. 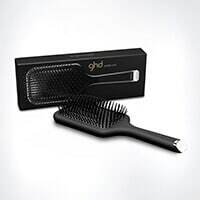 This is my second purchase of GHD and I will not buy anything else. I love how quick they heat up and have different features that prevent you from forgetting they are actually on, very safe to use. ... read more They are also reasonably priced. Excellent product in quality of finish to my hair and value for money. I have used other heat protect sprays and the finish was ok. But I wasn't totally impressed, so I decided to invest at twice the price in GHD heat protect spray. So impressed, it leaves my hair really shiny and smooth. Also I use less than the other products I've used before. I will from now on only be using this on my hair. Another fantastic GHD product. Lovely hair brush! The best hair brush i have ever owned! I always use to buy those cheap tacky ones where if you get stubborn hair that needs an extra tough brush through it the whole paddle would just come off or the bristles would break off. Not this brush! It’s gorgeous, its sturdy, i love the feel of it! Makes my hair shiny and silky and it glides through my hair easily and i have confidence its not going to break off whilst i’m brushing those knots out. It also brilliant to blowdry my hair with.